When the snow is blowing around this winter, we’ll be enjoying some autumn foods that we preserved on a rainy day this week. With fearsome forecasts keeping us inside, we made and canned applesauce and raspberry jam, and froze lots of spicy vegetable stew. 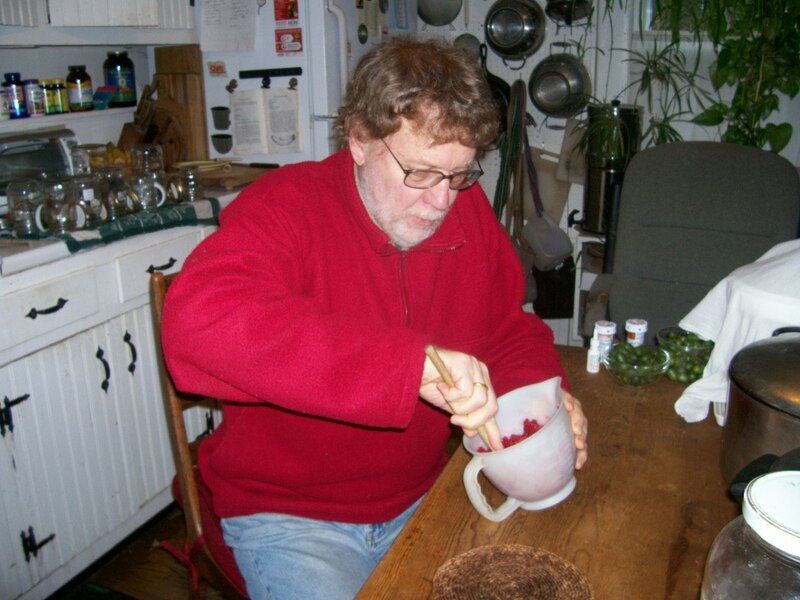 I bought eight pounds of “Utility Mac” apples for $7 at Clarkdale Fruit Farms in Deerfield, and they produced four quarts of sauce. We like to eat this spicy applesauce heated up for a nice dessert on a cold winter evening. And it’s easy to make! First, I washed, quartered and cored the apples. (Some people peel the apples, but I don’t bother.) I put them in a big pot with a teaspoon of cinnamon and a quarter teaspoon of ground cloves and a little water (to avoid burning the pan) and cooked them on a low heat for an hour. If you’re using apples other than Macintosh, this will take longer. 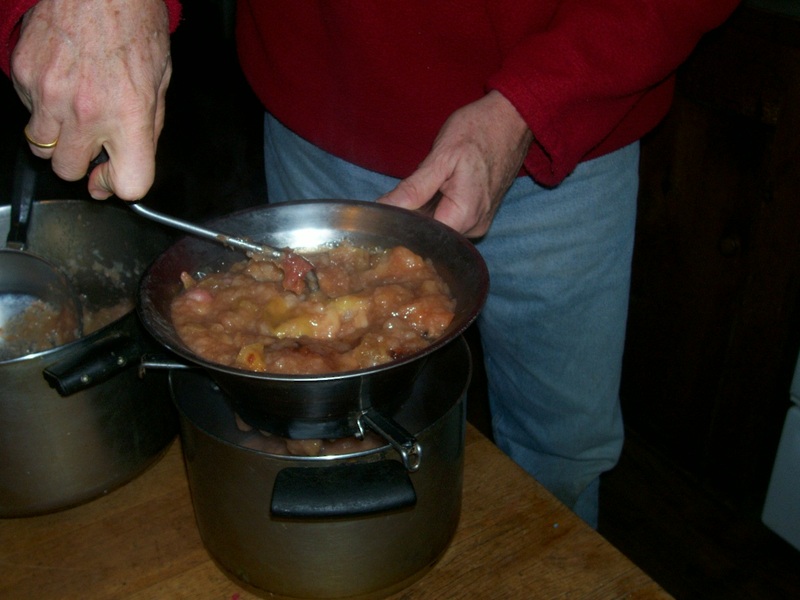 Then I put the softened apples through a food mill, as shown in the photo. This hand-turning process doesn’t take long and separates the sauce from the peels, which get turned into compost. 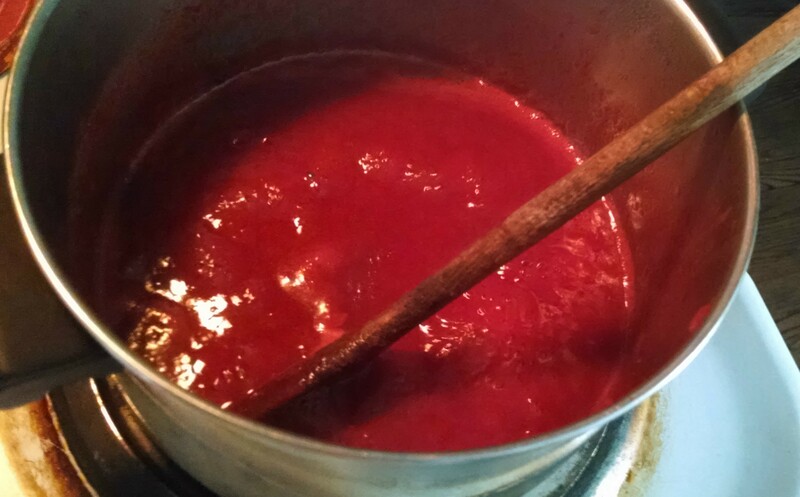 We then put the sauce into glass canning jars, put on lids and gave them a boiling-water bath for 20 minutes. They get stored in a cellar cabinet along with nine quarts left over from last year. Betsy and I have been picking raspberries every other day for the past month. We squash them (I’m shown doing this in the photo), add 2/3 of a cup of sugar per cup of berries, and freeze them in plastic containers until it’s a good day for canning. The night before canning, Betsy took them out of the freezer to thaw, and then put them in a big pot to cook down. The trickiest part of jamming is deciding when to turn off the heat. Too soon and you get syrup; too late and the jam is rubbery. Betsy’s signal is when the jam comes off a spoon in sheets rather than drops. At that point she puts the jam in clean jars, affixes sterilized lids and puts them in the same boiling-water bath that the applesauce was processed in, for 15 minutes. We had lots of green beans that we picked just before the frost, and they were sitting in the fridge threatening to go bad. I took off their strings and steamed them until tender and set them aside. I picked some celery and a rutabaga still growing in the garden and sauteed them with two cut-up onions. The great thing about vegetable stew or soup is that you don’t have to follow a recipe and it’s hard to completely screw it up. I cut up five small hot peppers and two green peppers and added them to the pot. I also added three shredded carrots, a can of kidney beans, a box of chicken stock and a half-cup of tiny pasta. I cut up the green beans and added them. After a few hours of cooking, the liquid had been absorbed and the mixture was delicious — but spicy! 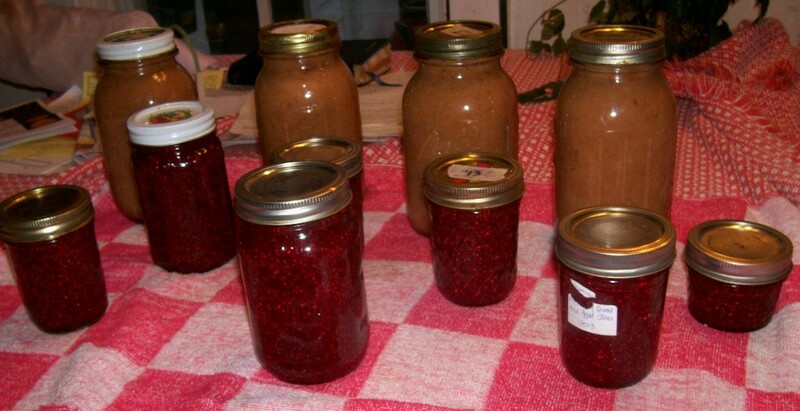 Betsy made jam and ketchup yesterday, using berries she picked from wild plants. Meanwhile, I made soup from leftover vegetables. 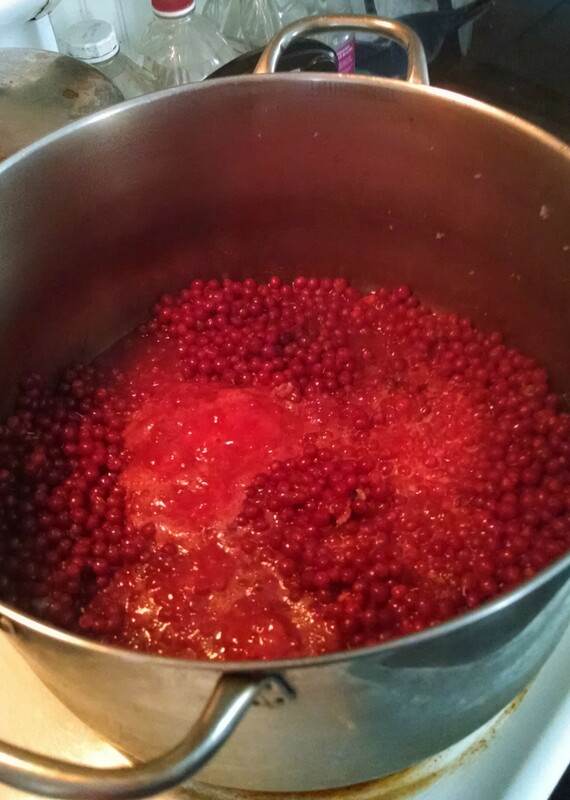 The berries Betsy picked were from a plant that’s now considered invasive but was once widely favored by conservation departments. We call it autumn olive, and it’s also known as autumn berry and Japanese silverberry (it’s not related to olives). It grows all over the place, even in cities, and was imported from East Asia. It fixes nitrogen in the soil, so it grows even in poor ground, out-competing native species. Its berries, red with silver dots, are coming ripe now, and are sweetest after a little frost. Betsy picked one and a half gallons in South Amherst on Wednesday and stored them in the fridge. 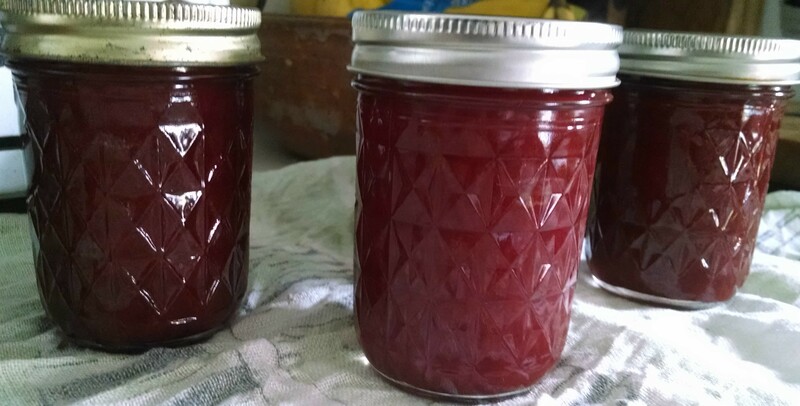 Yesterday she mixed some of them with juice from crabapples she picked in the summer, which provided the pectin that makes the jam congeal. She cooked it for about 20 minutes, then put the mixture through a food mill to extract and remove the seeds and skins. Then she mixed in a half cup of sugar per cup of juice and cooked it for another 20 minutes, until it ran off a spoon in a sheet. She put the jam in half-pint jars and preserved them in a hot-water bath for 15 minutes. It’s challenging to get the right consistency for jam; if you don’t cook it enough it’s too runny, and if you overcook, it gets rubbery and hard to spread. Betsy got this jam just right. It’s a little tart, but delicious on toast. Some people say that autumn olives’ taste is between currants and pie cherries. Autumn olives have loads of lycopene, which is proven to promote prostate health in men. Tomatoes are the best-known source of lycopene, but autumn olives have between seven and 18 times as much. Betsy also made ketchup from autumn olives yesterday. Using two quarts, she mixed in 1/3 cup vinegar, 1 1/3 teaspoon salt, 2/3 cup sugar, 1/2 teaspoon of allspice and 2/3 of a head of garlic. She simmered this mixture for 30 minutes, then put it through a food mill. She returned it to the stove and simmered for 30 minutes, stirring, until it thickened. She put it in five 1/4 pint containers and processed 15 minutes in a hot-water bath. She said it tastes a little like tomato ketchup, maybe a little tarter. I look forward to trying it! Meanwhile, I was busy making a vegetable soup that turned out so thick it was more like a stew. I started out looking for a way to use three cups of green beans that were a little overripe. The day before, I had removed their strings, cut them up and steamed them for about a half hour. 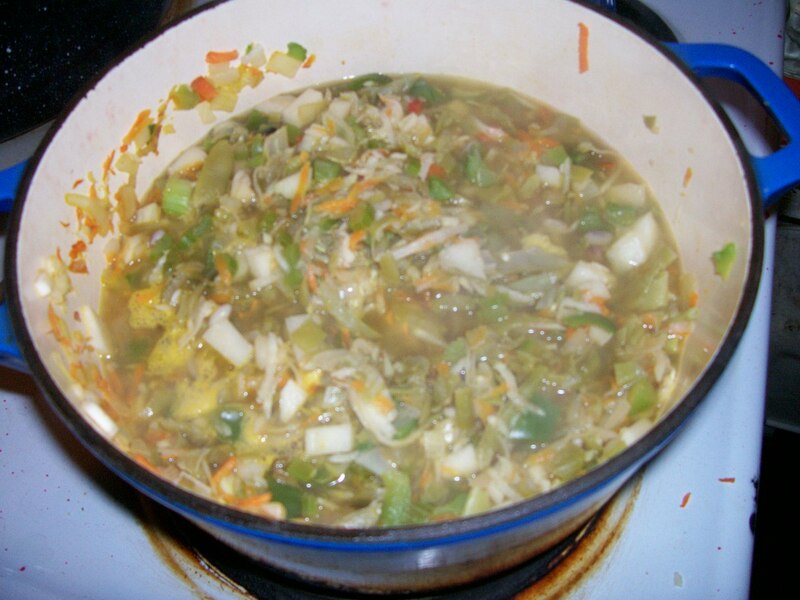 When it was time to make the soup, I chopped a large onion and put it in a big pot with some oil. I added about four stalks of chopped celery (which grew abundantly in our garden this year) and three chopped carrots. I looked in the vegetable bin of our fridge and found four old yellow beets Betsy had bought weeks ago. I peeled and chopped them and added to the pot. The great thing about soup is that it can be improvisational. I cut up four small hot peppers we grew this year and put them, seeds and all, into the pot. I added a box of organic chicken stock, some leftover shredded zucchini, and the cooked green beans. I added a teaspoon of salt, a half teaspoon of pepper and a little dried basil. At the last minute, I added a cup of Stellini pasta that had been sitting on a shelf for a while, and I think this is what turned the consistency stew-like. It was wonderful, with a nice combination of sweet and spicy. We added some chicken bits to it for our dinner last night and put the leftovers into the freezer for future use. We love making healthy food out of whatever is available! 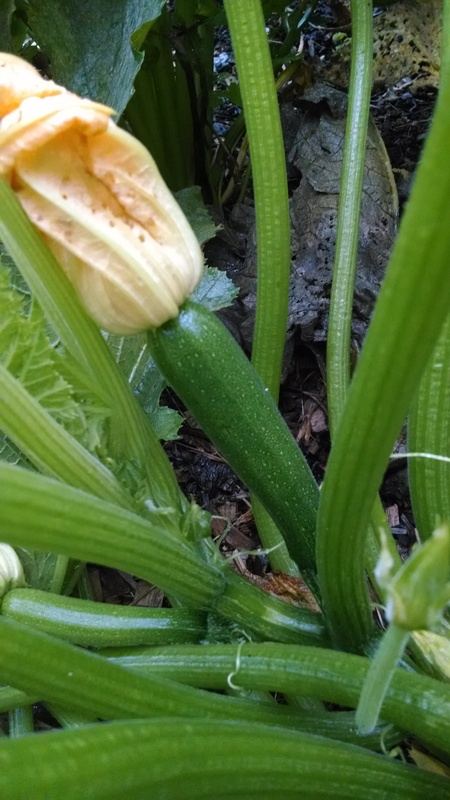 We have never harvested a zucchini in October before. Or a cucumber. Or a pepper. As the leaves start to turn, we have more warm-weather vegetables still growing than ever before. There has been no killing frost yet, but that’s only part of the story. We were able to avoid the insect infestations that have typically zapped our zucchini and cucumber plants, so they survived to keep on keeping on. We covered the zucchini plants for longer than usual, frustrating the vine borer moth. When we opened them up and exposed their flowers, they attracted cucumber beetles, which I squished. Both plants benefited. There were fewer 90-degree days than usual this summer, but the first frost is coming later. This is enabling us to eat up the cucumbers still in our fridge, and give more away, while knowing there will still be more to pick (such as the one in photo above). The zucchini plants look exhausted, but there are still some tiny ones with the potential to grow to full size (photo below). Over in the pepper bed, Betsy and I have had a difference of opinion. She wanted to delay picking the abundant peppers because she thought they would turn red and become sweeter. Well, that hasn’t happened, but insects and slugs have gotten into some of them. Later this week, I plan to pick all of the peppers, core them and cut them up, then freeze them in plastic bags. The hot peppers (called “Czech Black”) are doing very well and turning a beautiful color, though they’re not as hot as expected. The celery is also still in the ground. We’ve never grown this before and have much more than we need, and I’ve already made several batches of celery soup. I’d like to know other ways to preserve it. Also in the backyard garden are rutabagas, kale, celeriac and carrots, which can all stand a frost. Over at the community garden, eggplants and butternut squash are the only ones left. I’ve let the eggplants go a lot longer than usual, but I think that they just don’t get any bigger this late in the season. I’ll probably make eggplant caviar and freeze it next week. It’s about time to pick the butternut squash. I’ll set them outside to cure for a week or so, then store them under our bed, which by mid-October is cool enough. Here’s a great recipe from the Moosewood Cookbook for squash soup, with a secret ingredient I often ask guests to guess. I tell them it’s something you don’t usually find in soup, but many people consume it every day. Bake squash in 375-degree oven for 30 minutes or until soft. Cool and scoop out about 6 cups of flesh. Put it in a blender with the stock and puree. Combine in kettle with orange juice. Heat butter and add garlic, onion, salt and spices. Add mushrooms, cover and cook for 10 minutes. Put in kettle with the squash mixture. If you like hot stuff, add a little cayenne. 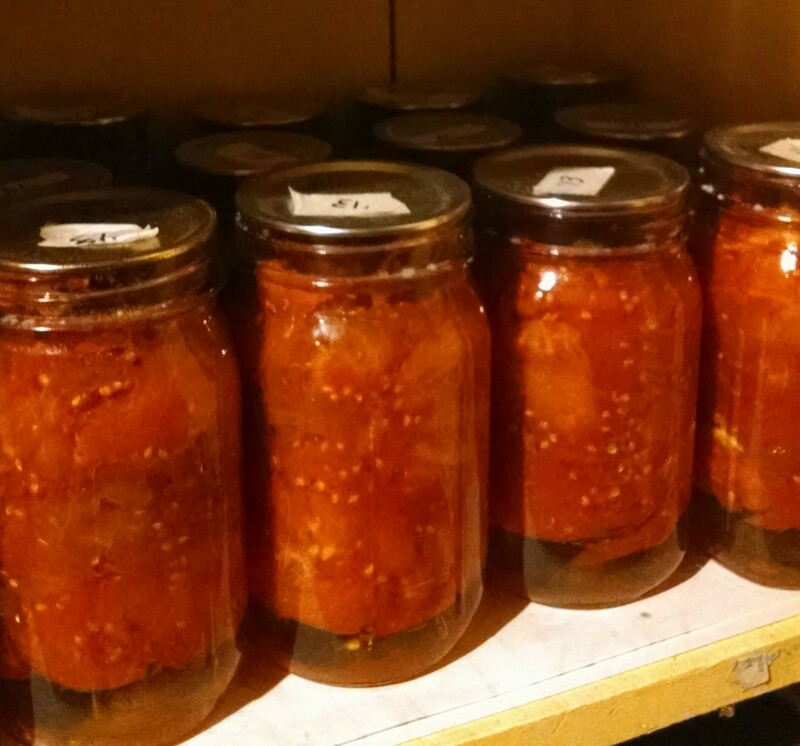 In the fall, a yeoman’s fancy lightly turns to thoughts of…food preservation. Yes, Betsy and I have been busy as squirrels this week, preparing our garden produce for eating in the winter and spring. 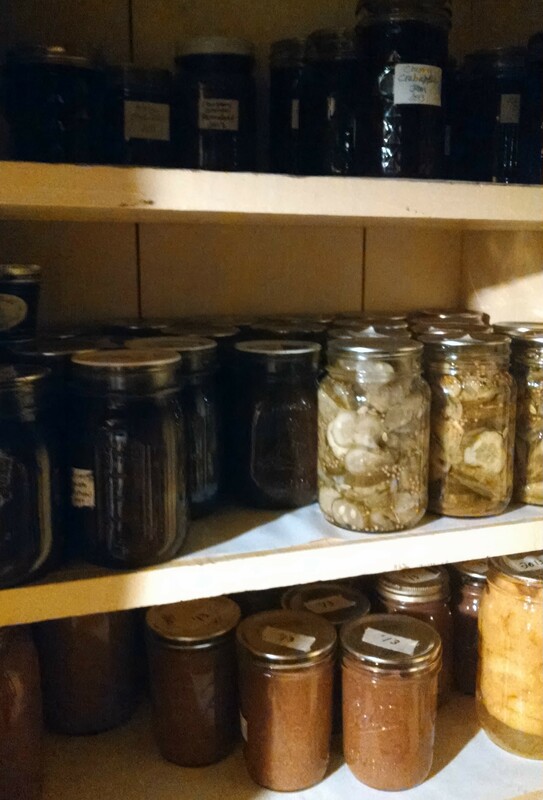 Canning, freezing and pickling like mad, we have placed in our basement cupboard and freezer lots of fruits and vegetables to enjoy when the snow flies. Tomatoes. We have canned 18 quarts and have five left over from last year. That’s about half of what we typically preserve, because many of our tomato plants were zapped by late blight. I remove the skins while Betsy puts them in jars and then in a hot-water bath. We have about 45 tomatoes left, but we expect that our canning is done. Beans. Our plants have been prolific this year, but Betsy doesn’t like the taste of beans that have been frozen. So we make Chili Dilly Beans, in which the raw beans are placed in jars with vinegar, red pepper flakes, mustard seed, dill seed, salt and garlic. We’ve put up 19 quarts (some are shown at right in photo). We chop off the ends and string them, a task that goes twice as fast when we do it together. Pickles. 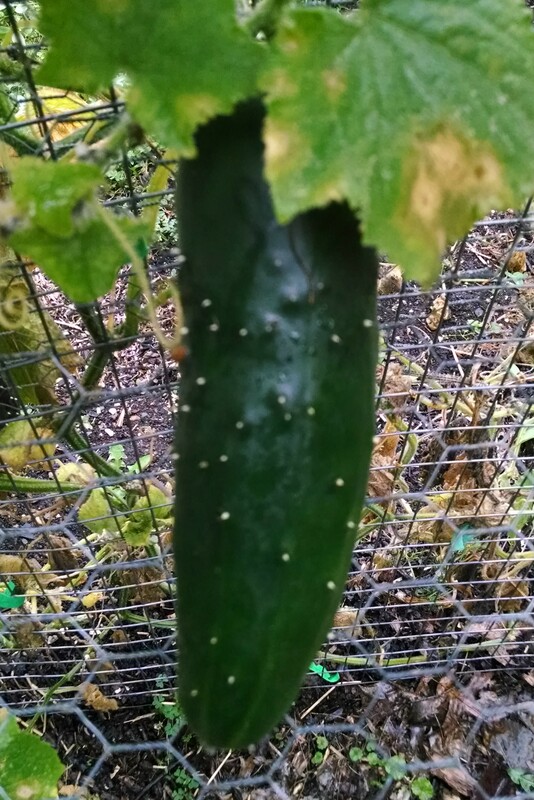 It was a great year for cucumbers. 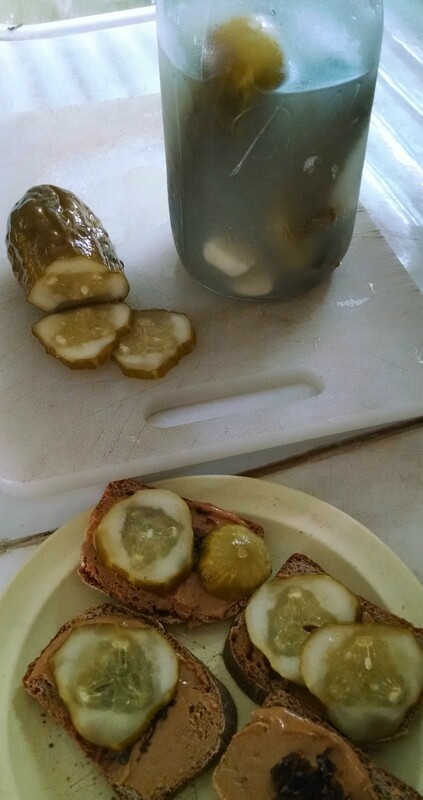 We’ve made 19 pints of bread & butter pickles, a sweet variety that’s great with fish (at left in photo). Six of them will be for sale at the Cranberry Fair at First Congregational Church in Amherst on Nov. 21. 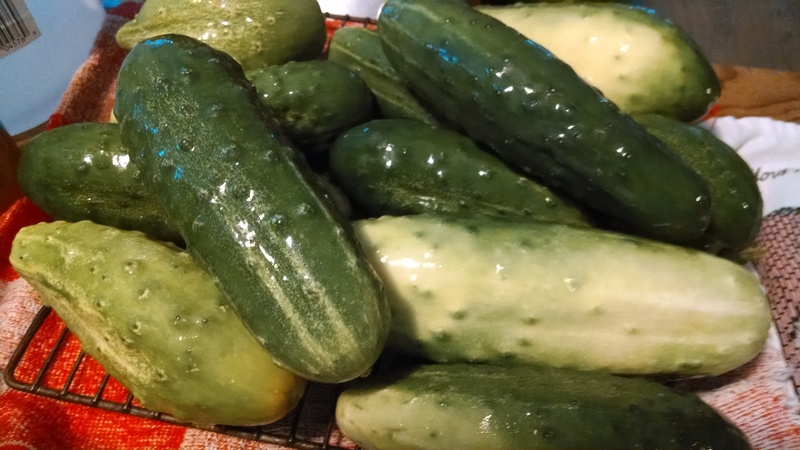 Betsy made seven quarts of sour fermented pickles that can sit in the refrigerator for six months. Chutney. When late blight killed the tomato plants, we picked many of them green. They were turned into Green Tomato Chutney, a condiment that’s tangy and a good meat accompaniment. It makes a great gift. We made 25 pints of it. Peppers. These plants, which grew on the site of a former compost pile, did very well. We froze about eight bags of sliced green peppers and will freeze a lot more after they turn red. We also have some prolific hot peppers called Czech Black and we’ll freeze those whole. Peaches. We don’t grow these but buy seconds. We canned six quarts of them and froze three pints. Peaches are wonderful to eat in the winter. Berries. We froze lots of plastic boxes of strawberries that we picked locally. Our blueberry plants did well, not as ravaged by fruitflies as last year, and we froze them whole, in many plastic boxes. Our raspberry bushes are yielding well and will continue to produce until frost. We pick them together, and Betsy separates out the bad ones, squishes them, adds sugar, and freezes them so that she can make jam out of them whenever she feels like it. Zucchinis. I made 15 to 20 quarts of curried zucchini soup and froze it. Betsy sliced up some and froze them in bags for use in winter soups and stir-fries. I made lots of zucchini bread, some of which will be for sale at the Cranberry Fair. Eggplants. I’ve frozen about seven plastic boxes of Eggplant Caviar, and plan to do more as they bulk up. I have about 12 eggplants still growing, though I wonder if they’ll get much bigger in this cooler weather. Next month we’ll pick about 15 butternut squashes and store them under our bed. And we’ll buy lots of apple “seconds” and turn them into applesauce, which we will can for future use. One of our favorite desserts after a winter dinner is plain applesauce, heated in the microwave, or, it we think ahead enough, on the woodstove. Yes, we’re up to our ears in cucumbers, and the bountiful harvest is pouring in from the farms and gardens of this beautiful valley. But when it comes to produce, there are only so many freshly harvested, locally grown cucumbers, blueberries, tomatoes and peaches we can eat while they are in season. And if we want to eat local to support local agriculture and lower our food’s carbon footprint, what are we going to eat during the cold frosty winter ahead? This is where food preservation comes in. Next Monday, Aug. 18, Food For All is offering a free food preservation workshop from 5 to 7 p.m. at the Not Bread Alone kitchen, 165 Main Street, Amherst. Food For All has a ¾-acre garden at the UMass Agricultural Learning Center and is staffed by Sustainable Food and Farming Program students and community volunteers. 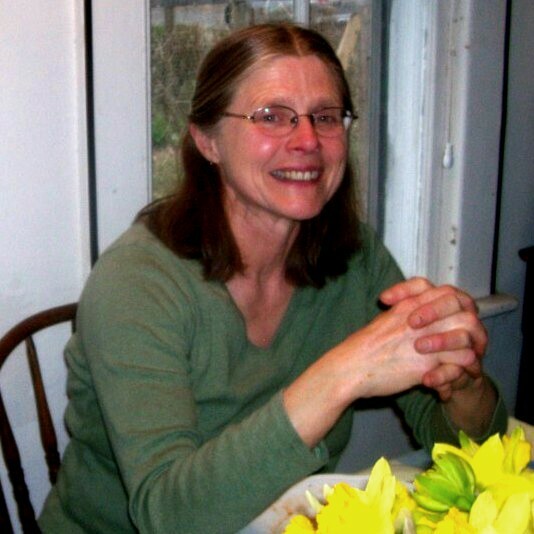 The workshop is called Local Food & Resilience: Preserving the Bounty and involves a short presentation on skills for local food system resilience, followed by a hands-on canning and fermentation workshop. Participants will go home with their own preserved food, as well as useful handouts and resources. Recipe sharing is encouraged! To learn more about Food for All, including its mission to supply vegetables and herbs for the Amherst Survival Center and Not Bread Alone, check out the story in Friday’s Daily Hampshire Gazette. To preserve all those cucumbers for the long winter ahead, Nick and I use two pickling methods. For years we have made bread and butter pickles, using a recipe we learned from a friend and fellow gardener, Ed Stanek. 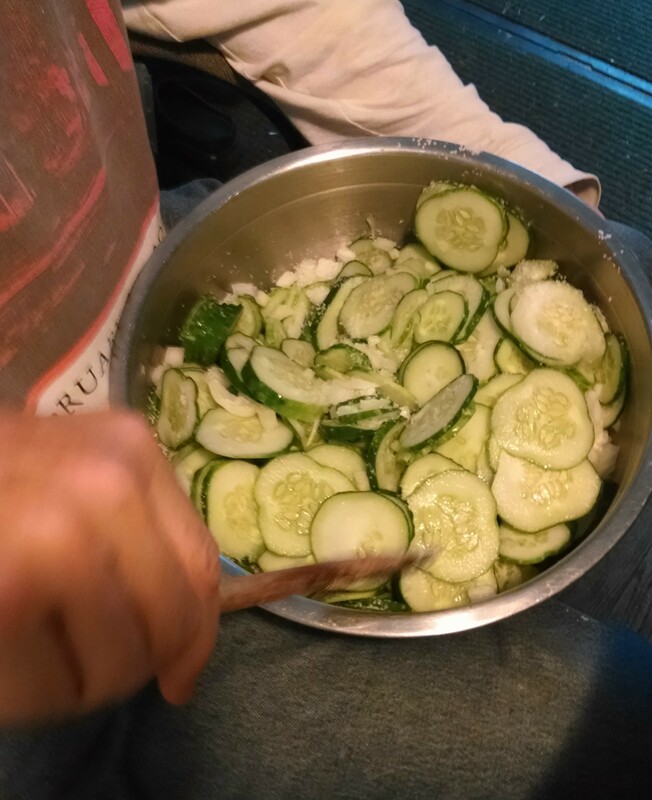 After washing and slicing the unpeeled cucumbers, we mix them with chopped onions and minced garlic. Then we salt them and cover with ice cubes and let them sit for 3 plus hours until the ice melts. We drain them and then add them to a heated mixture of sugar, turmeric, celery seed and mustard seed, water and vinegar. After cooking briefly, we put them in pint jars and process in a boiling water bath for 5 minutes. Great on tuna sandwiches! After attending a workshop on fermenting, I have also been making fermented dill and garlic pickles. I like the Sour Pickle recipe from Sandor Katz’s book Wild Fermentation. I use filtered water for the salt brine so the residues of chlorine in our tap water won’t suppress the helpful microbes that preserve the cucumbers. I use a food-safe plastic bucket for my fermentation, covered by a plate which is weighted down to keep the cucumbers submerged in the brine. It took a little over a week for the cukes to turn into crisp, salty pickles. Then I transferred them from the crock into wide-mouth canning jars and put them in the fridge. I think I will have some for lunch today!